We head back to the top-left side of the Dyson Mega Delve node map for the next three maps (although the last of the three may be delayed by a week or two as I post commercial-licensed maps at the beginning of March – see below for more information). The Crypts are carved out of old mines under the necropolis of Bryn Mynnyd. Many niches and alcoves have been dug into the walls of the old mines to house the many dead here. The whole expanse smells of dampness and death, with old bones occasionally underfoot as likely as old stones from the mining. Exits from this map lead to the Lost River Node to the right, the necropolis of Bryn Mynnyd to the left, and the death cultists to the north. There are a few tombs in the catacombs, but none harbour the undead that adventurers would likely expect. These tombs are quiet and still, appropriate resting places for those who have passed on into forgotten history. The real threats down here are corpse-rot, a few traps, some strange oozes, and strange humanoids who seem to feed off the darkness itself… Only should someone be foolish enough to raise the ire of the death cultists north of this area will the dead rise under their command – even they respect the dead enough to not bring them to the mockery of life that is undeath except in times of true need. 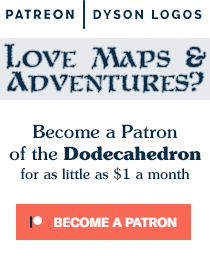 These bi-weekly map posts are brought to you by the many awesome patrons like David Magill, Michael Galle, Duane Sibilly, and Sasha Bilton who keep the site and maps coming thanks to their pledges to the Dodecahedron Patreon Campaign. 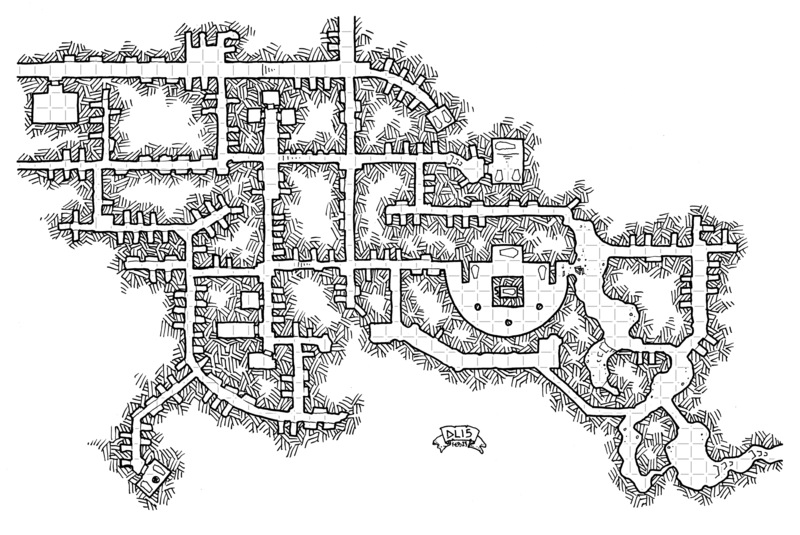 If you like these maps and would like to see more of them and have the money to spare, please check out the campaign that keeps these free maps flowing to everyone. Speaking of the Patreon Campaign, while this Friday’s Map will be of the Death Cult map to the north of this one, we’ll then have a week or two break from the Mega Delve when March rolls around. The campaign reached the target goal of $300 this month, and that means at least one of the March maps (likely two or three) will be released under a free commercial license. So instead of sticking publishers who want free maps from me with partial areas from the Mega Delve, we’ll be posting some other cool maps in early March before posting the last two maps of the Mega Delve (the necropolis and the harpy tower) later in the month.